The Local History Group would like to extend a warm thank you to Angela Dodd Crompton for putting together such a well prepared guided tour of the Gardens at Ambrook. We visited in August but it is an interesting experience any time of year as many of us have become enthusiasts about these nationally significant but still very mysterious gardens and their constant battle with nature. 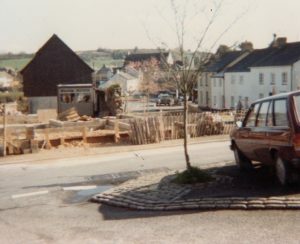 A view from the Square in 1977 with the Danish Bakery gone.